Discussion in 'Android OS' started by jigwashere, Nov 28, 2018. I've been using Gboard for quite a while, but I find it a bit frustrating. Swype was awesome, but I guess it's not available anymore. Any ideas? Hook, Mi An and scjjtt like this. Swiftkey. Great predictive text. Can swype if you want to. Run by microsoft now, which you can take as a positive or not. Predictions also still if you use a physical keyboard, software board hides and a thin line of predictions remains. jigwashere, scjjtt and Hook like this. Swiftkey here too. Predictions are very good compared to other kb apps I've used (Gboard, Chrooma, LG's own, etc), or maybe I've been using it so long that it's learned what/how I type. I denied Swiftkey permissions to read my SMS, email, contacts, etc. In fact, I haven't granted any app permission, and it works fine that way. I guess it's enough that it can read everything I type . What I like most about Swiftkey is that it works very well with two simultaneous languages. I keep the kb layout on Spanish, and can type mixing Spanish and English and Swiftkey will predict quite well. I don't use predictions when using the hardware keyboard, though. I've set autocorrect, auto capitalize and other options to off when using the physical keyoboard. Mi An, jigwashere, scjjtt and 1 other person like this. Mi An, jigwashere, scjjtt and 2 others like this. Just curious what you find frustrating in Gboard. I love it. I can have a number row on the main keyboard, swyping works spectacularly and nice skins. I think maybe I'll relook Swiftkey-- haven't tried that since Gingerbread. Mi An, jigwashere and scjjtt like this. Yes - I'm still using Graffiti & loving it. 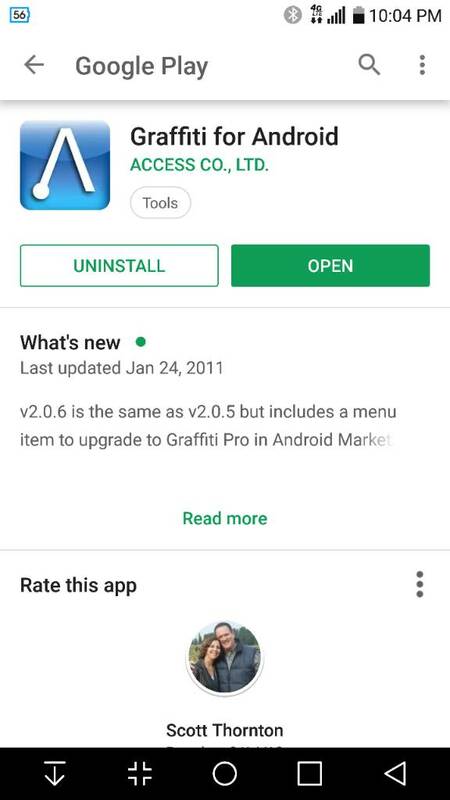 It is just like Palm's Graffiti 1.0 which I preferred over 2.0 because I felt 1.0 was more accurate for me than 2,0. I have been using Graffiti since my first Palm in 1998 - it is SO hard to teach an old dog new tricks! RickAgresta, Mi An, Hook and 2 others like this. Swype was great at recognizing what I was trying to swipe. There is a lot to like about Gboard, as you point out. I wonder if it would help if I tried different settings. Maybe I just need to turn off autocorrect. Oh, yes, do that. I turn that off for any keyboard I use, although I find sometimes they do it anyway. It seems to be an interaction with some apps. I adjust the keyboard size, theme (I use a black keyboard) and include the numbers with the main qwerty board. RickAgresta, jigwashere, scjjtt and 1 other person like this. I'm still using Samsung's keyboard, but I switched the microphone to Google, and off of Bixby. I use the microphone quite often, as it is far faster than typing. That was a chore that I don't even remember what I did now. I never got good at swyping and made more mistakes than I liked. I hardly use emojis, and prefer the old school smileys using punctuation. RickAgresta, jigwashere, scjjtt and 3 others like this. I wonder if it would help if I tried different settings. Maybe I just need to turn off autocorrect. I hardly use emojis, and prefer the old school smileys using punctuation. I love this one. I keep it pinned on Swiftkey's clipboard, and also assigned it a shortcut. TESR, RickAgresta, jigwashere and 3 others like this.